Swansea Trade Unionist and Socialist Coalition (TUSC): Free the trade unions to defend working people and nationalise essential services..
Free the trade unions to defend working people and nationalise essential services..
One of the best gigs I've been to was the Selecter in TJ's, Newport. It was a long time after the height of their fame but the energy, particularly from lead singer Pauline Black, enthused everyone in the place to dance for the whole show. Pauline Black had a piece in the Independent today: "If I were Prime Minister: The days of privilege and inequality would be over". There's a number of suggestions in the article that would not look out of place on a #TUSC election leaflet. In particular, check this out: "I'd also repeal the anti-union laws so that working people can defend themselves against the bankers and corporations. And I'd implement a process of bringing essential services back into public ownership, starting with public transport." Unshackling the trade unions and public ownership - 2 key points that TUSC stands for and which are enormously popular with working class people. Yet the last Labour Government, failed to act on either, despite having a clear majority for 13 years. And there's no reason to think that the new Labour leadership would act any differently. They've failed to support any strike action by workers attempting to defend themselves from relentless Con-Dem cuts. 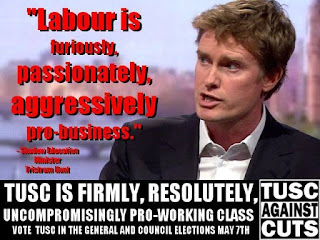 Shadow Education Secretary, Tristram Hunt, who showed his union commitment by crossing a UCU picket line to deliver a lecture on Marx, has recently declared that Labour is "furiously, passionately, aggressively pro-business". Labour refuses to commit to nationalisation of railways or utilities, including Royal Mail, despite their own conference voting overwhelming for it. It's full of common sense ideas that used to appear in Labour manifestos but which you will only get now from TUSC. And Selecter are still touring; if you get a chance, check them out.